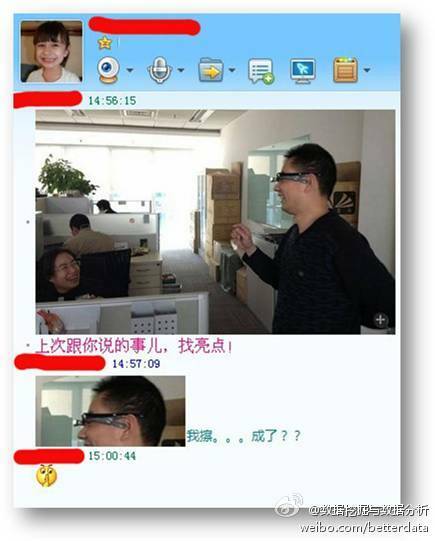 We all know that Chinese search giant Baidu is notorious for receiving much inspiration from its US counterpart, Google, and according to the above IM screenshot published on April Fools’ Day (now bear with us here), the former is apparently already working on its own version of Glass. This claim is seemingly supported by a couple of articles from Tencent Tech and Sina Tech, who said that the spectacles feature a tiny LCD, image recognition technology, voice control technology and bone conduction audio. These all sound familiar, no? The articles also mentioned Qualcomm’s “latest power management chip,” which would allegedly push the device’s battery life up to 12 hours. That said, Baidu’s real goal is apparently to offer an open platform for wearable devices in all shapes and forms: watches, necklaces, headphones and more.